S (Scripture): Matthew 7:28 When Jesus finished saying these things, the crowds were amazed by his teaching, 29 because he taught them like one who had authority, not like their experts in the law. O (Observation): Jesus has a way with words. Like…what he says is AUHTORITATIVE. What does that mean? Jesus is at the end of the Sermon on the Mount. At the end of a teaching, a good rabbi would cite all of his sources from which he got his interpretation. In this case, Jesus does not refer to any prior teachings. Instead, his words stand on their own. Jesus’ interpretation of Scripture and tradition and all of the things of life supersedes what came before him, including teachings from scribes, priests, and others. That is NOT to say that we simply “throw out” what was written or said prior to Jesus. This means that we look at the Scriptures and traditions through the lens of Jesus’ saying and actions. Jesus reveals meaning and understanding scriptures and life situations, and he does so with authority. We have our preconceived ideas about faith, life, Scripture, religion, and on and on. We are typically shaped by our parents/family, friends, colleagues, social media, and more. The people of Jesus’ day were also influenced by religions and social pressures and more. In today’s text, Jesus shows his authoritative teachings and starts to re-shape long-held interpretations and traditions of the Church (the people of the Jewish faith). 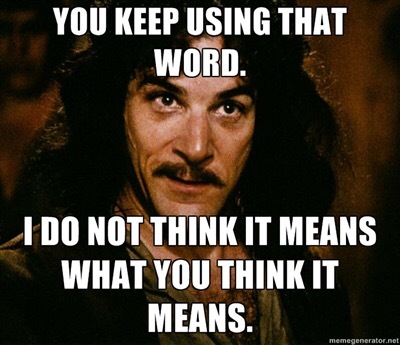 Jesus does his own “Inigo Montoya” thing in this Sermon (Matthew 5-7) by reclaiming ideas about how to love God and love neighbor, and what it means to express faith. He points out customs and traditions and says, “I do not think you interpret that the way it is meant.” And he lays out his understanding and sets the tone for living out one’s faith. Re-read Matthew 5-7. See if this devotion holds water. If so, think about your own life and what Jesus needs to re-interpret for you and for your faith life. What do you sense? What have you discovered in this process? P (Prayer): Lord, you entice us with a teaching and a love that goes beyond our understanding and re-shapes us in ways we never saw coming. For this, and for your grace, we give you thanks. Amen. This entry was posted in Digging Daily and tagged Authority, Jesus, Sermon, Teaching. Bookmark the permalink.